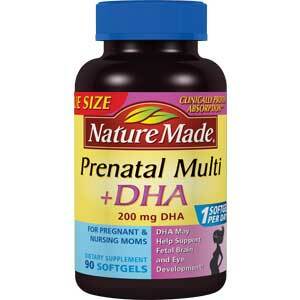 Nature Made Prenatal Multi + DHA combines the key nutrients of a prenatal multivitamin with 200 mg of omega-3 fatty acid DHA into one softgel. This supplement contains wheat. There are no artificial flavors, preservatives, or yeast. Colors derived from natural sources – no synthetic dyes. Suggested Use: Take one softgel daily, with food. Check with your primary health care professional before using this product if you are taking any medications, as drug-nutrient interactions may occur in some cases.